Let's just say that Week 3 of the six week One Room Challenge has started off on a very low note. As in, we spent four hours this weekend waiting in Emergency. Sean had an incident with our old table saw that left two of his fingers with rather large gashes. There were stitches involved but no lost appendages and no one fainted despite all the blood so I'm calling this a good outcome all things considered. But we're marching on so let's take a look at all the things that did get accomplished this week! 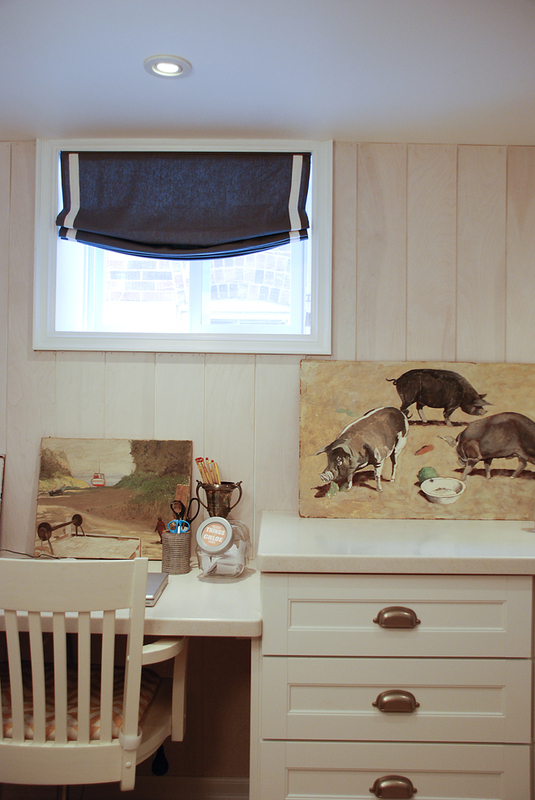 Paint is one of the easiest ways to transform a room and this room was no different. This living room, home to the fireplace and future nights of snuggling on the velvet Barrymore sofa, demanded a bit of coziness. 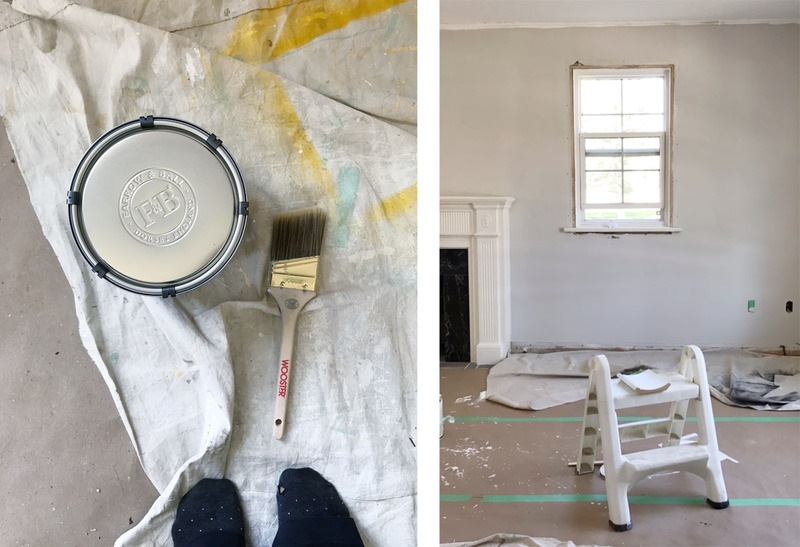 I've long been a fan of Farrow & Ball - they have such history and their paint colours always seem to have depth and character - and was excited to try some of their paints in this space. We sampled a few off-whites and light greys (James White, Shadow White, Cornforth White, and Ammonite) and decided on Ammonite which seemed the most neutral, neither too warm nor too cold. We used the Estate Emulsion finish on the walls which has a nice matte, chalky finish and gives a deep saturation of colour that looks pretty consistent day to night. Once the paint dried, we got to work on the mouldings. 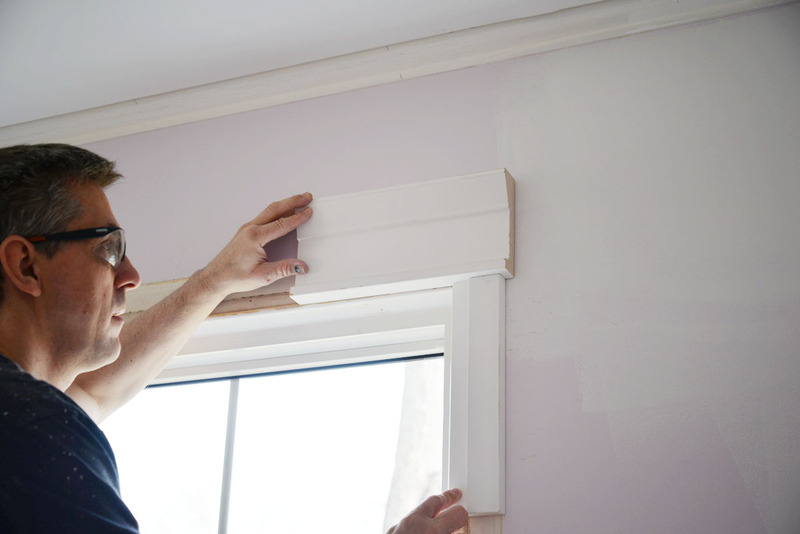 If you've been reading here a while, you'll know we are huge fans of any sort of trim work. From panelled walls to beadboard to shiplap, we've used interior finishings to add character to our last house and our cottage. 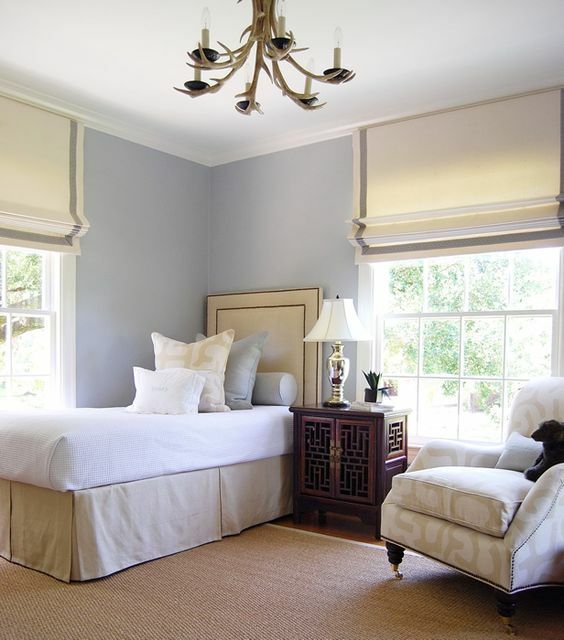 Mouldings can make a space feel finished, thought-out, and bring life to boring walls. The tricky thing with mouldings is getting the proportions just right. Walk into a room with well-designed mouldings and it just feels good. Our house already had mouldings when we purchased it and you might wonder why we tore them out. While they were pretty, they felt undersized especially for the living room which needed a bit of grandeur. 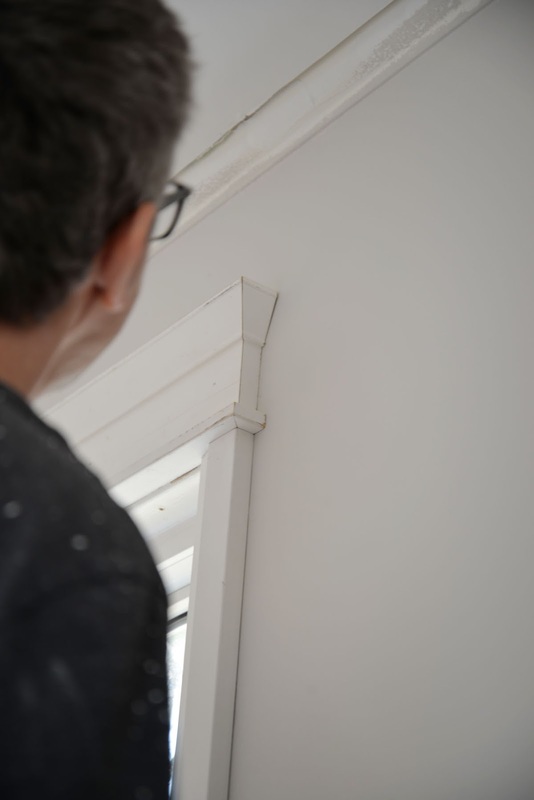 Luckily, Metrie, ORC Sponsor and the largest supplier and manufacturer of solid wood and composite moulding in North America, takes the guesswork out of choosing the right mouldings for your space. They offer professionally designed and coordinated collections of mouldings and doors. We were immediately drawn to the crisp and clean look of the Very Square collection and felt it worked with the preppy + traditional style we wanted for this room. That is ALOT of moulding. Now installing all of this trim requires the right tools and our decade old RYOBI chop saw wasn't going to cut it. 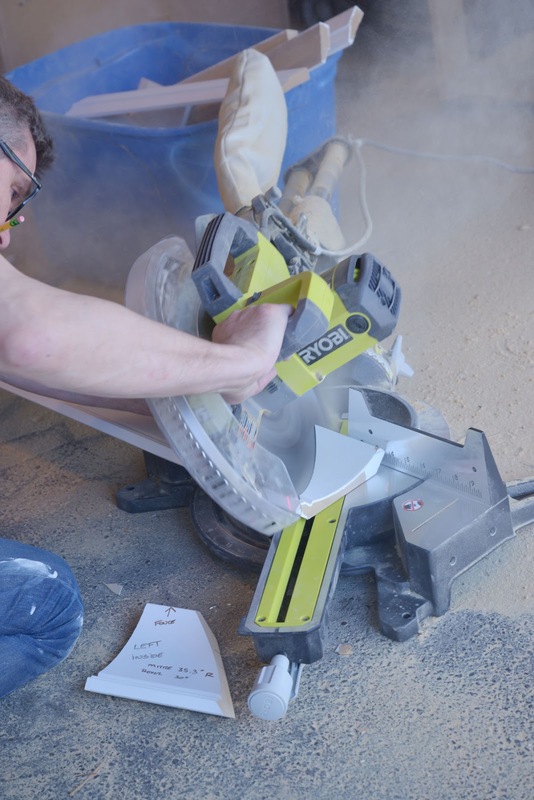 My friends at RYOBI Canada kindly provided me with the RYOBI 12" Sliding Compound Miter Saw with Level and the RYOBI One+ 18V 5" Cordless Random Orbit Sander to get this very labour-intensive job done. 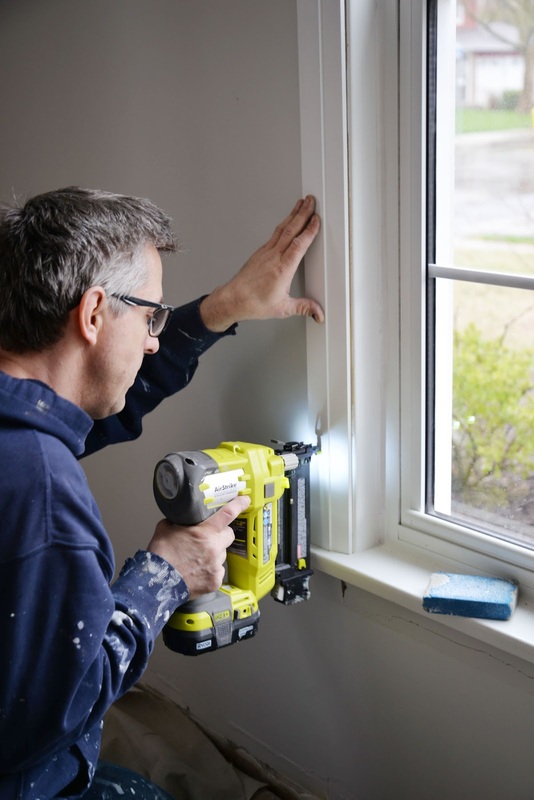 Sean has long been a RYOBI tool user and we're recent converts to the ONE+ system which has more than 70 tools that work with the same lithium battery platform, so you can use the same battery and charger to power all of your RYOBI tools. Our reliable RYOBI ONE+ 18 gauge Brad Nailer was the other tool we used for this job. then moved on to doing the architraves. It might look simple but the architraves have a return (two ends mitred to create a corner) which requires very precise cutting. It creates a much more finished look though and is worth the effort. ...and then there was the crown moulding. We've never done crown moulding before and it took us a while to figure out how to set the proper angles on the new saw. The saw made actually cutting the compound angles very easy though and the laser line was especially useful. Once we got the hang of the tool, we decided it would be a good idea to create templates which would allow us to both ensure we were cutting the material correctly, and which we could use to dry-fit the crown in place. We cut our first piece and realized it would help to have wood blocking behind to support our large 6 1/4" crown. It was while cutting the wood blocking on our old table saw that Sean had the accident. I can't even think about it too much now without feeling queasy! And so, the 12' long piece of crown is currently sitting on the living room floor. Even dry fitting the crown in place was difficult so I'm not sure this is a job we can DIY. We just might have to rush and bring in the pros to finish this off! and these relaxed roman blinds in our basement. 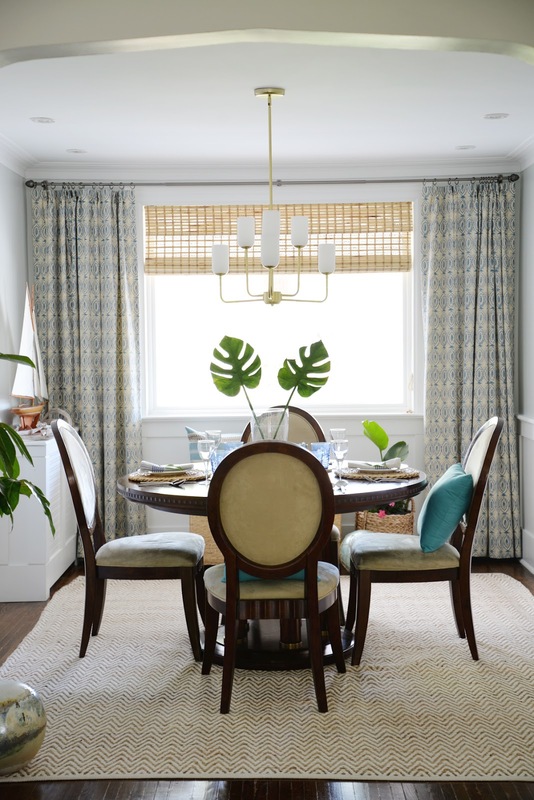 Their service and quality of work is always impeccable and I wouldn't go anywhere else for custom window coverings. I miss you, old basement! I'm opting for flat roman blinds for the living room with a ribbon banding along three edges. The blinds will be inside mount, similar to the photo above, for a crisp look. Gorgeous, right? But this would mean covering up the mouldings - and given that Sean almost lost two fingers for the cause, who am I to deny the man his mouldings? Ha! Seriously, though, I think the roman shades and substantial window mouldings will work well together to create a classic and timeless look. 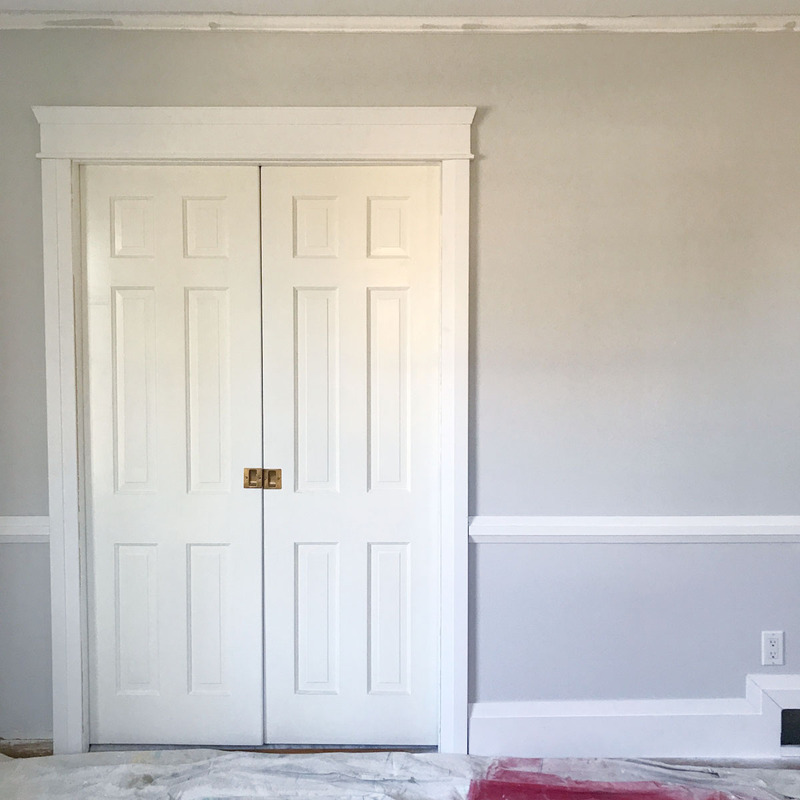 We're using Helsinki White for the window coverings, a cooler white with great texture, and I can't wait to see them in a few weeks. and could probably DIY a similar kind of solution using off-the-shelf kitchen cabinets. Sadly though, I don't think our piecemeal solution would ever live up to the quality of the rest of the room. 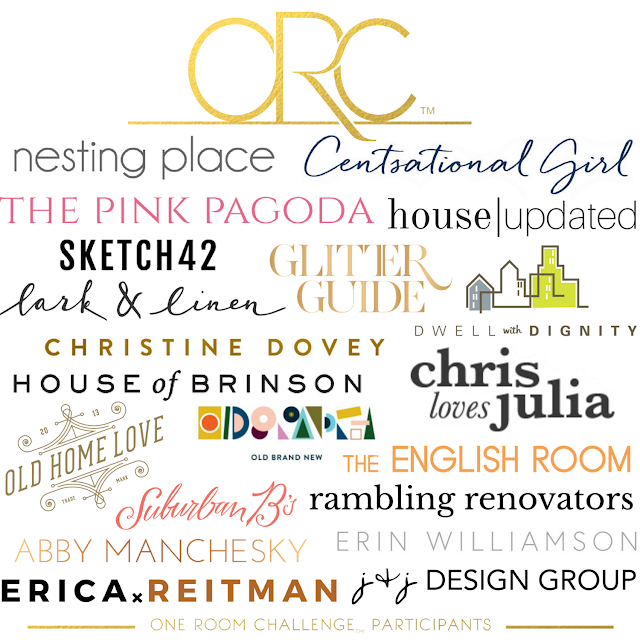 It would always look "DIY-ed" and that's definitely not the look we wanted for the first room you see when you enter our home. Graham built some vanities at my sister's house so I know the quality of his work will be spectacular. He's meticulous (something we appreciate!) and we spent quite a bit of time together to get all the details just right. 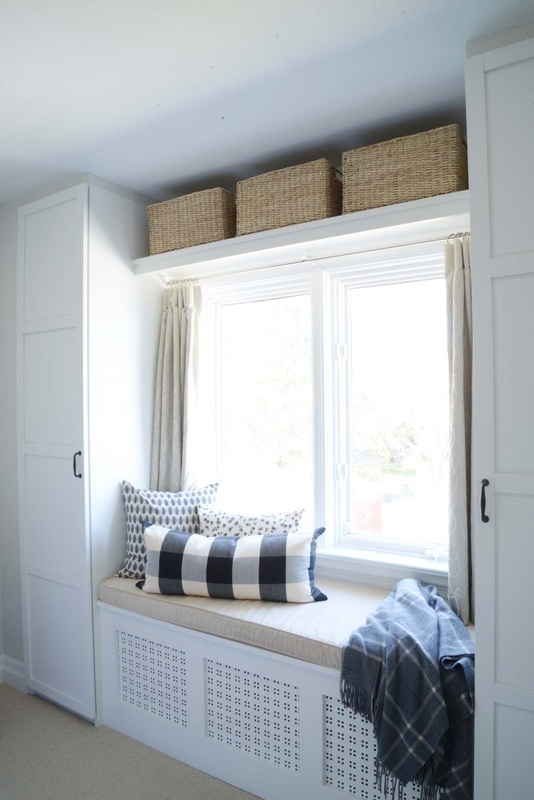 The amount of thought that goes into a piece like this is pretty overwhelming: should you have a bulkhead over the window? 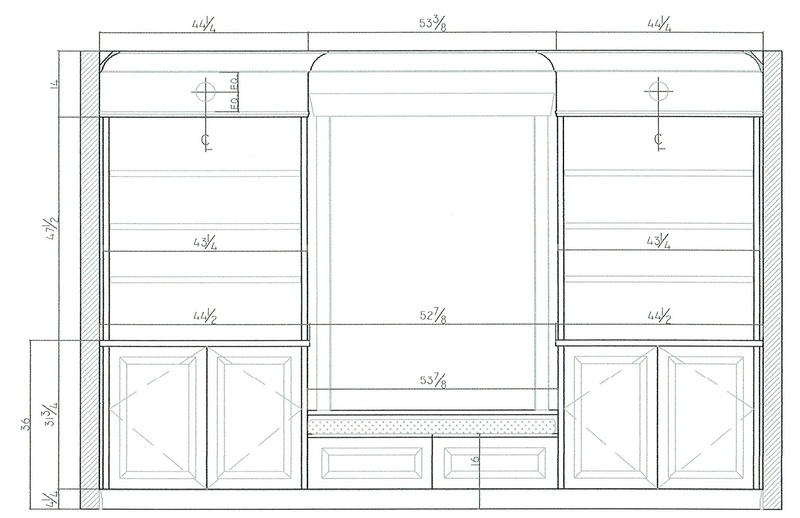 What height should the counter be? How many doors should it have? How will the crown sit relative to the face of the bookcase? 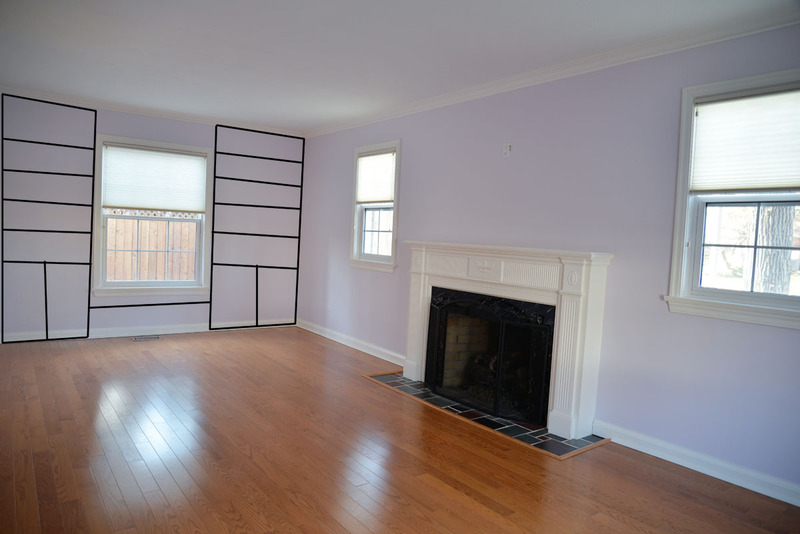 Do you carry the baseboard across the bottom? Is the bench flush with the cabinets or recessed? So. Many. Questions! I'm very excited to see this drawing come to life. It will be a pretty significant detail in the room and, along with all the moulding, the change will be fairly dramatic. If you've made it to the end of this very lengthy post, hooray. We've still got miles of panel moulding to install, gaps to fill, moulding to paint, furniture to move in, lights to install. Oh, and we're hosting Chloe's 8th birthday party here on Sunday with a dozen little girls and a chocolatier to get them all messy and filled up with sugar. CRAZY! 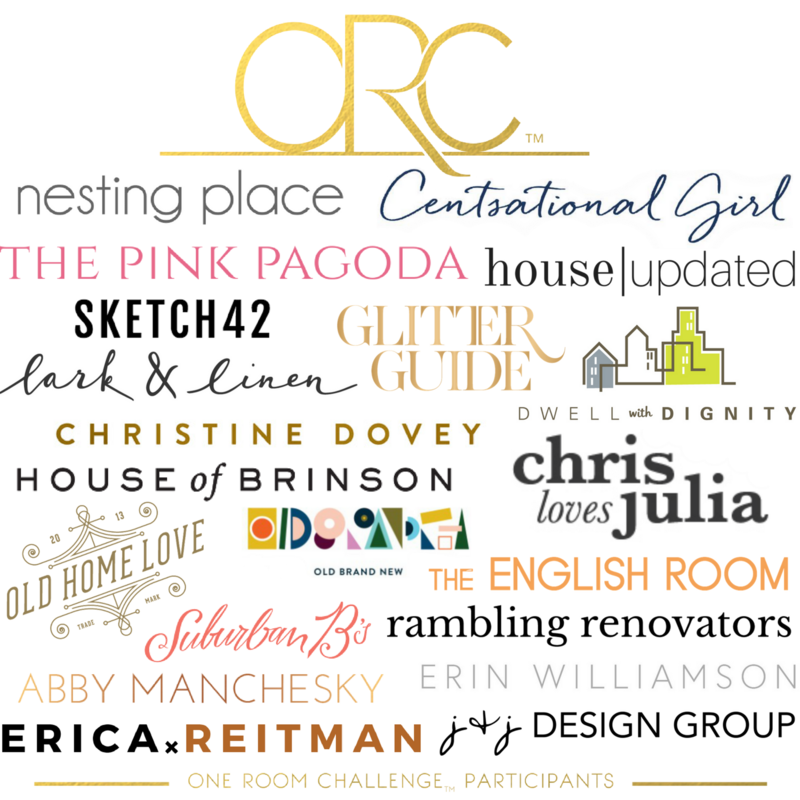 Now head over to see what my fellow designers are working on for their One Room Challenge spaces. We're half-way through! 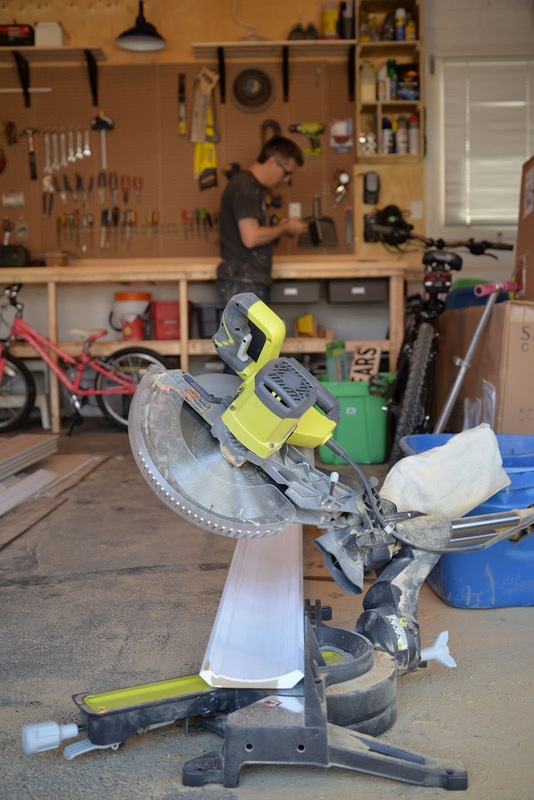 Disclosure: Tools in this post were provided by RYOBI to facilitate a review. The opinions expressed are entirely my own.